This post is a collaboration between Ray at the design blog RMB Design and Ian at sports blog The Steelers N’at. An unlikely pairing? Perhaps, except they’ve been friends since they were in diapers and will likely be friends when they are in diapers again. Anyway, we’ve worked together to bring you the most comprehensive review you’ll find of the designs of the sweaters that the 2014 Olympians will be wearing. Warning: this post, at 3,500+ words, far exceeds my average of about 500, so if you were trying to squeeze this in before a pee break, you ought to reconsider. Hey, I told you it was comprehensive. Hockey sweaters are so named because they were originally just that, a sweater that was more or less the same color as that of your teammates. And really, not much more was needed prior to television. Most spectators at the game probably weren’t close enough to see the details on a sweater, and people listening to game on the radio presumably didn’t care so much about what the uniforms looked like. So for the early development of colors and logos, the design only had to “work” from one distance: far away. Over time, leagues such as the NHL became profitable enough to standardize uniforms, fans began watching games and highlights on TV and then youtube, and today they are purchasing sweaters in record numbers. So what makes for a successful design today? We asked ourselves that question and came up with three different categories for success. First is functionality. From a visual standpoint they still need to catch your eye from far away, but they should also look good up close for the shots of the bench or the celebration of a goal. This is meant to be a fairly objective category. Can you make out the colors and patterns from far away? Is there added interest in the logo and detailing that maintain the visual interest up close? If yes on both counts, then it’s a “functional” sweater. Second, and probably most difficult to quantify, the sweater needs to reflect the values of the organization. There is a lot of pressure here at the Olympic level because athletes wearing the sweater are representing an entire nation. Defining success in this category is hard, and strangely enough it’s easiest to see what designs were successful only when they are changed. For example, look at the visceral reaction that fans have to unwelcome changes in the design of a sweater. Changing something that fans have come to know and love can feel like a betrayal if not done properly because people have developed strong feelings for what the sweater represents to them. That’s a big reason we are also looking at the sweaters from 4 years ago and not just the ones for the Olympics this year. Thirdly, finally, and most controversially: people have to want to like it and want to buy it. There’s no denying that sports and money are tied together now, even at the Olympic level. If national values and sportsmanship were the only things that mattered, each team would have one white sweater with their flag on it. Sweaters need to look cool and they need to sell. 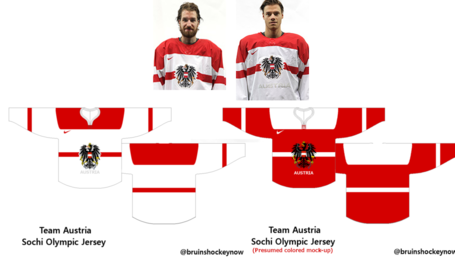 Ian and I looked at the sweaters for every country competing in hockey for this year (2014) and also the sweaters each team wore from the last Winter Olympiad (2010). Then we ranked them in each of the above categories on a scale of 1-5, for a total possible score of 15. Listed below are the sweaters for each country, the year they were worn, their total score, and a breakdown by category in parentheses like this: (Functionality/Values/Appeal). A couple of notes before we start: not all teams had released how their final sweaters would look when we started this project. Some of the images below may not be what the teams will ultimately be wearing. We only scored the sweaters for the men’s teams. There are two women’s teams that aren’t represented below (Germany and Japan), the rest of the sweaters are fairly similar. 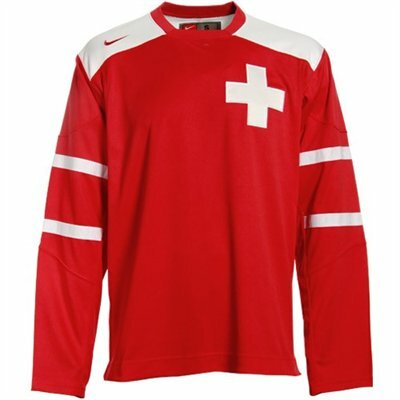 There are two teams that we did not rank the 2010 sweaters because they did not qualify 4 years ago (Austria and Slovenia). And finally, the sweaters below are ordered from highest-scoring to lowest-scoring by my total score. I’ve listed Ian’s scores as well and excerpted both of our comments, but if you want to read his write-up (which I highly recommend) it is here: [http://thesteelersnat.blogspot.com/2014/02/2014-olympics-preview-hockey-jerseys.html] He’s got our full comments over there as well as some bottom-line data showing how the average scores of this year compare to those of four years ago. To the line! Ray’s score: 15 (5/5/5); It’s tough to make red and white look original, but Canada crushed it with the 2010 version. Tough to tell in the picture we have, but there is a detail in the leaf done in a darker red that has some native American motifs. Best sweater on the slate, hands down. Ian’s score: 15 (5/5/5); There’s really nothing to hate about these jerseys. They look great up close where you can see the Vancouver-inspired detail inside the maple leaf and from far away. Overall a great set. 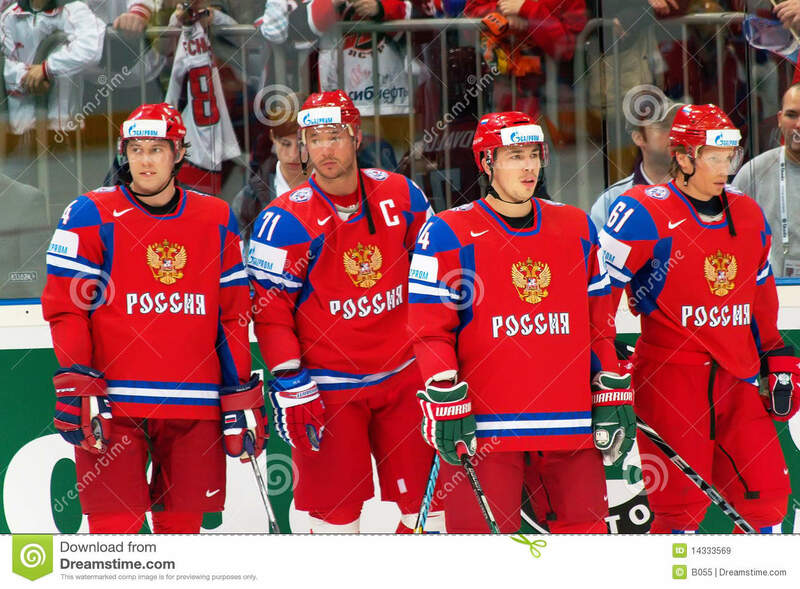 Ray’s score: 14 (4/5/5); I think the Russian sweaters are amazing. I love the boldness of the double eagle on the away sweaters and I like that the home sweaters are more than just a palette swap of the aways. 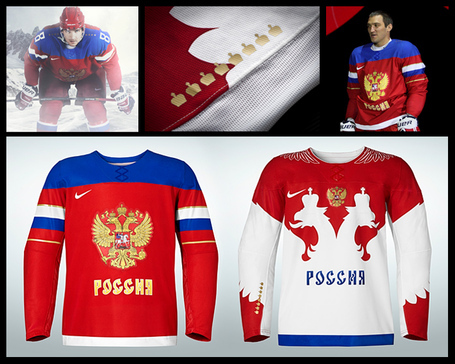 I knocked it down a point because the crest is tough to read from far away, but that little quibble aside, Russia’s sweaters are amazing. Ian’s score: 13 (4/5/4); The host nation knocked it out of the park with these. The only reason I didn’t give it a full score is that the blue on the shoulders of the home jersey is only on the front and gives a disjointed look to the back where it sharply ends so that the name plate can still be red. Ray’s score: 13 (4/5/4); This ranking represents the biggest delta between my ranking and Ian’s ranking. I don’t have solid justification for this, but I just think the “flag” motif on the home sweaters works. Again, I have no justification for this, because I slammed Finland for doing the same thing. I guess there’s just no accounting for taste. Ian’s score: 7 (2/3/2); This was a tough call because the white jerseys, aside from some extraneous striping around the shoulders, are some of the best jerseys the Czechs have ever worn. That, however, is contrasted by the flag jerseys which are some of the worst. Ray’s score: 13 (5/5/3); At first glance these look pretty similar to the USA 2014 sweaters (which, spoiler alert, are way down the list). It’s the details that set it so far above the USA sweaters, though. First, the crest works a lot better with the color scheme. The large patches of color are less distracting than stripes. Also, the barely-visible stripes are actually the words to the national anthem, which I think is incredibly cool. Ian’s score: 12 (3/5/4); Up close these look great, and they are simple enough that they will probably look good from far away too. My only complaint is with color consistency – the dark blue of the jerseys is not the same blue as on the national crest. Ray’s score: 11 (4/4/3); A lot of the 2010 sweaters have stripes on the inside of the sleeve and underarms which is not great, but this one actually pulls that aspect off because the colors are so dark that they don’t clash. I did knock points off because I didn’t like that color red on that color blue. Ian’s score: 12 (4/4/4); National crest? Check. Country’s name? Check. Added points for the reference to the national flag with the cross on the arm of the white jersey. 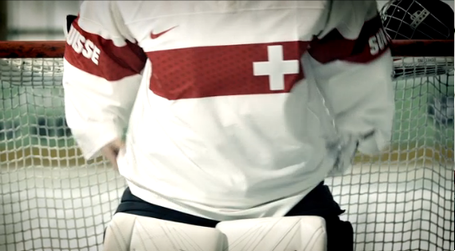 Ray’s score: 10 (3/3/4); The Switzerland sweater really makes the most of the hand it was dealt. What do you do with red, white and a cross? Don’t go crazy with stripes, make the logo stand out by setting it off-center, call it a day. Ian’s score: 11 (3/5/3); Does anything typify Switzerland more than being boringly neutral? Nope, which is why these jerseys get full marks [in the values category]. Ray’s score: 10 (3/4/3); A lot of the Eastern European sweaters feature a crest and some stripes. This one is the best of that bunch because the stripes actually reference the flag. I also like that “LATVIJA” is set in line with the top stripe, so from far away it reads as a stripe but up close it becomes letters. Ian’s score: 11 (3/4/4); The shoulder tabs for the numbers aren’t great and the size of the striping on the sleeve differs (the top stripe is smaller than the bottom stripe while on the national flag they are the same size). The white jerseys are a really good set, the only missing element would be the correct proportions on the striping to match the national flag. Ray’s score: 10 (3/4/3); I was initially really low on these (total score of 7) until I learned more about the design (see resources below). I just thought the design was pretty bland, but it turns out that the white sweaters were a throwback to the 1960 Olympics (that other time the USA won gold on home ice) and the dark sweaters are a massive improvement over the wavy ‘S’ of the ’90’s. Ian’s score: 13 (4/4/5); The white “road” jerseys knock the total set down a peg because of the lettering. I don’t mind the diagonal letters but the blue-with-red-outline looks blurred from a distance. These were some of the best USA Hockey jerseys yet. Simple, straight-forward, America. Ray’s score: 9 (3/4/2); This is a pretty average sweater across the board. I like the boldness of not including the name of the country on the sweater and just letting the coat of arms do the talking. The goofy stripes really kill it for me though, this would be a much better sweater if they kept the stripes in check. Ian’s score: 9 (2/4/3); This was an improvement over some of the past jerseys the Czechs have worn in the past, but overall a middle-of-the-road look. Ray’s score: 9 (3/3/3); Latvia kept many things the same but went a little more conservative and lost a couple of the things I liked about the 2010 look. Ian’s score: 10 (3/4/3); I felt like these took a step back from the 2010 design because they increased the size of the stripes on the arms (which still aren’t proportional with the flag) … For as flag-obsessed as these Nike jersey sets have been in 2014, you’d think they would’ve gotten the proportions of Latvia’s flag right. Ray’s score: 9 (2/3/4); I think I like this sweater because it’s so bad that it’s good. It’s just the name of the country in downward-stepping letters and some randomly placed stripes with colors that don’t work next to each other. 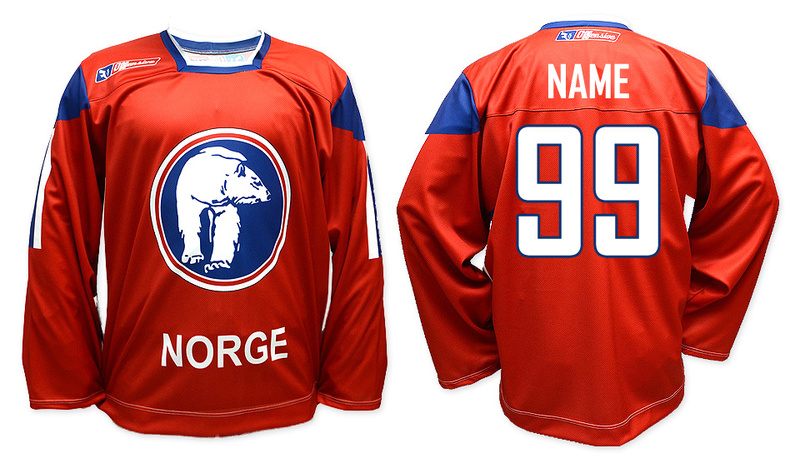 I want to walk around in a sweater that says “NORGE” on it. Ian’s score: 10 (4/3/3); Simple and straightforward. “Norway” that’s it. Having a player named Torre Vikingstad also has some appeal. Ian’s score: 10 (2/5/3); Apparently Nike’s design was to make the jerseys look like a Swiss Army Knife was laying on a piece of paper. The biggest change was the addition of the name of the country onto the sleeve. This doesn’t detract from the jersey. Ray’s score: 9 (3/3/3); If it ain’t broke, don’t fix it. Blue and gold are sharp colors, said the Freeport alumnus. Ian’s score: 12 (5/3/4); Don’t mess with success. Sweden has had the same look for international hockey for over a decade so why change now? (Hint: Don’t) I took a point off because I personally think yellow jerseys are hideous, probably the only thing worse is orange jerseys. Just a personal opinion though. Ray’s score: 9 (3/3/3); If it ain’t broke, why add fake laces? I took a point off for those but then I added it back because that boat is pretty rad. Ian’s score: 11 (4/3/4); Essentially the same look as 2010 but with the shiny plasticy Viking ships added to the shoulders. It’s a subtle detail that probably won’t show up on TV, but it’s more of the extraneous Nike crap that I hate. Ray’s score: 8 (3/3/2); I think that if there was some kind of design checklist, this would be a “better” sweater than the 2010 version. But I think the problem is that it’s too textbook; the colors are nice, the logo is there, the name of the country, too, but there’s no personality. Ian’s score: 10 (4/4/2); The bear logo is a modernization/simplification of their hockey crest and looks badass. Lose a point for not having Torre Vikingstad on their Olympic roster which means you can’t buy a jersey with a bear on the front and “Vikingstad” on the back. Ray’s score: 7 (2/3/2); I think that’s actually a magic eye, if you look at that picture of 4 Russians and kind of cross your eyes you can see a sailboat. Or maybe they just wanted to display Russian resourcefulness by making the sleeves out of discarded scraps of red, white and blue fabric. Either way it’s bad news. Ian’s score: 9 (2/4/3); Perhaps due to having the same color scheme as the Washington Capitals (and suffering from the same red-blue color blend from a distance) these don’t score higher. I wouldn’t buy one, but they kept enough of the “Russian Red Machine” image to strike fear in their opponents. Ray’s score: 7 (2/3/2); This one winds up on the lower end of the “flag with crest” category of sweater. The middle stripe is disproportionately narrow and gets visually jumbled where it intersects the crest, and the darkness of the crest means it gets lost in the field of red on the dark sweaters. 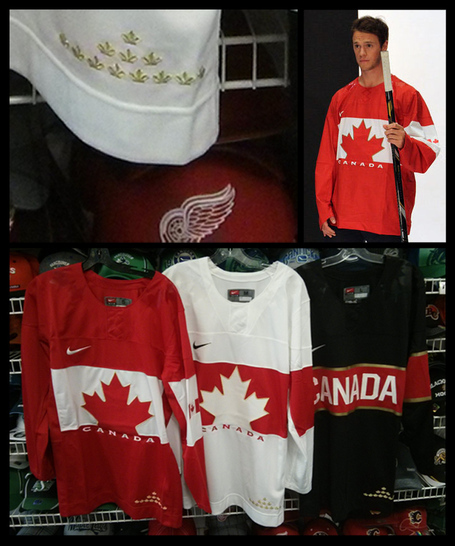 Ian’s score: 7 (2/3/2); This borders on the “LOOK AT OUR FLAG” jersey concept with the national crest over the top. There’s just too much going on here. Ray’s score: 7 (2/3/2); 2010 was the year of the patchwork sweater, evidently. Not digging it. Ian’s score: 6 (1/3/2); Much like the Russian jerseys, there’s simply too much going on here. Red under the arms, tabs on the shoulders for the numbers, and the color patter of the striping on the sleeves is opposite that around the waist. Basically these were the same sweater design as the Russian ones with more things that annoyed me. Ray’s score: 7 (2/3/2); Finland took a lot of risks here and none of them panned out. Kudos for the boldness, though. 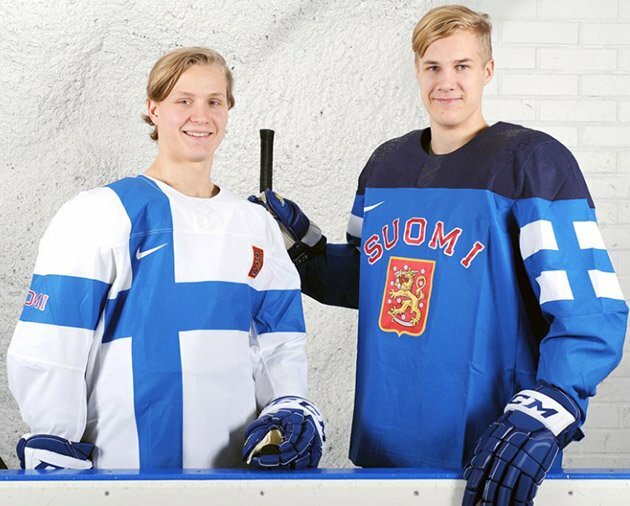 The only thing I can think of when I see the light sweaters is that kid trying to hide himself against Finnish flags, like those scenes in Arrested Development where Tobias follows Lindsay around. Anyone else? No? Ian’s score: 7 (2/3/2); Apparently someone thought people needed to know what Finland’s flag looked like. As in, their ENTIRE away jersey is the flag. Also, they added a GIANT flag to the arm of their home jersey. It looks terrible. Ray’s score: 6 (2/2/2); How the mighty have fallen. All the great detailing has been lost, replaced with a cheap looking outline of a leaf and lettering too small to be read at any distance. It’s a good thing they fixed that on the black sweaters and made the letters comically large, great for people who want to take in a hockey game from low earth orbit. Ian’s score: 6 (2/3/1); Fake laces, shiny plastic maple leaf on the shoulders (because, Nike) and a black jersey that looks like they handed over their jersey design to the Nazis. I’m not sure what’s worse – Finland’s full-jersey flag or Canada’s jersey where the flag covers the body and one sleeve and the other sleeve is bizarrely blank. Ray’s score: 6 (1/3/2); I thought the world had moved on from neon clothing and geometric patterns, but Slovenia wants to bring them back. I can’t say I like the idea, but mad nostalgia props for coming up with a sweater they could have worn on an episode of Wild and Crazy Kids. Ian’s score: 5 (1/3/1); Ugh, neon green. Green appears nowhere on the Slovenian flag yet their soccer jerseys are dark green and they opted for the visually worse neon green here. 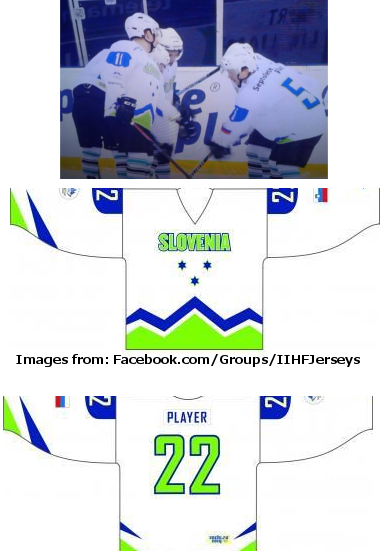 I could go without seeing these uniforms in action, but since Slovenia faces the US, I guess I’ll have to. Also, that will be the most visually unappealing game of the entire tournament. Ray’s score: 4 (1/2/1); If Slovakia’s sweaters are the authentic shirts you get from a concert, the USA sweaters are the knock offs you can buy in the parking lot for five bucks. I hate the fake laces, the stars, the stripes on the biceps, the crest and everything else. I added a sarcastic bonus point under “values” since I think it’s hilarious that the crest, along with the average American, has become more pear-shaped over the years. Ian’s score: 3 (1/1/1); They are basically replicas of Slovakia’s design with Nike’s shiny, plasticy stars on the shoulders. What is with the crest? It’s not the country’s primary or alternate crest and it is disproportionate and pear-shaped (bloated at the bottom), which draws the eye away from the country name. The only reason this gets one point from me [in the “appeal” category] is that Americans are wearing it. On any other nation it would get a 0. Arranging it visually was what really changed my perspective from what I initially expected. Also, if you’ll notice, I put “worst” in quotes up there to emphasize that these are still just opinions despite all the numbers that we put to the sweaters. Even though I think the sweaters for Finland are ridiculous, I appreciate the thought and work that went into the design and execution. To me, it’s a miss. So what? You can’t have a great design without taking a big risk, so don’t get the wrong idea. Ain’t no hatin’, just appreciatin’. Some more than others. So that’s what I learned. Leave a comment if you think we totally whiffed on any of our scores, or if you were disappointed at the lack of hockey puns and Mighty Ducks references. Check out Ian’s post as well, he’s got a great write-up of his own over there. And while you’re there make sure you read the rest of his posts about the Olympics, he’s got some excellent previews of the events already up. And after you’re done with that and you still want to read some more, there are some great resources below that we came across during our research (including a TV schedule for all the hockey events). Enjoy the Olympics! All photos used under fair use. Thanks to everyone on the internet that had the pictures we used. For more click the pictures, they all lead to the original page where we found them. This entry was posted in Critique and tagged Critique, Design, Fashion, Hockey, Hockey Sweaters, Olympics, Sochi, Sports, Winter Olympics 2014. Bookmark the permalink.